On our recent Minnesota trip, we flew Alaska Airlines (same price as Northwest, more leg room, and NO charge for first checked bag, take THAT, NWA). Alaska does not serve Coke or Pepsi products, instead, they serve Seattle-based Jones Soda, sweetened with cane sugar instead of high-fructose corn syrup. Also, am I the only one who keeps seeing these ads, apparently from the High-Fructose Corn Syrup Council or something, where a woman refuses a product that has HFCS in it and her friend challenges her to say why she is rejecting it? And then chirps that it's fine in moderation? Duuuuude. I can't draw you out a diagram of why smoking is bad for me, but that doesn't mean I'm gonna start sucking down Marlboro Reds. And as the TIME article points out, it's hard to moderate your HFCS consumption when it's in everything. Those ads are among my favorite things in the world. The first one I saw was the couple in the park, where the woman pulls out a popsicle out of nowhere. (Who brings a popsicle on a picnic???) Anyway, yes, HFCS is "made from corn," as they sneeringly point out - but the way I figure it, sugar is made from... sugar. Seems like a better bet. And the HFCS Woman in the commercial is such a b*tch about it, rolling her eyes at her helpful friend and making her feel stupid until the friend finally just compliments her on her shirt? And HFCS Woman just goes, "Mmmm hmmm." I HATE those commercials. "Hey man, everyone is doing it. Your a big dummy if you don't want to munch on a big stick of HFCS." Basically I find them to be an assault on my intelligence. If you hadn't already, watch 'King of Corn' - it's a great documentary on the corn industry. Wow, I wasn't aware that people were so adamantly against using vast chromatographic columns of zeolites or the calcium salts of cation exchange resins to adsorb and separate the fructose from the other components. My family loves to buy "Dublin Dr. Pepper," or DP made in Dublin, TX, with real sugar. It's sooo much better. I'll definitely have to check out the Pepsi throwback. I like the idea of Jones sodas better than the taste. They are pretty nasty, reguardless of what sugar they use. And the Jones version of coke doesn't mix nearly as well as Coca Cola with Jim Beam at Seahawks games. I can't even begin to explain how much I hate the HFCS commercials. I try pretty hard to avoid the stuff, although I do have a regular soda once a month or so, and I don't know which characters in the commercials I hate more: the ones who are smart enough to point out how awful the other person is for eating it but not smart enough to explain themselves, or the people who think it's OK to eat because "It's natural and is made from corn." To that, I'd say, yeah? Well, crack is made from something that was once a plant that grows naturally, too. Heroin comes from plants. Pot isn't even processed before people use it. Tobacco is a plant. 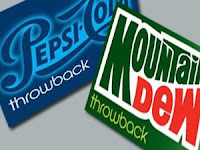 That being said, Pepsi throwback sounds like a great idea. I can't wait to try it.